BY HOLLY M. DAVIS POLITICAL AFFAIRS MANAGER MASTER BUILDERS ASSOCIATION MBAKS Launches Evergreen Campaign Institute If you or someone you know has an interest in exploring what it would take to run for public office, contact Holly M. Davis at hdavis@mbaks.com and SB 5254 (the Buildable Lands Improvements bill). During the 2018 session, we are following condominium liability reform and minimum net urban density, among other measures, as they make their way through the short legislative session. Given the importance of government regulations to your bottom line, it is critical that we have quality candidates running for public o§ce with whom we can build relationships so that they can better understand our issues. To that end, we are changing the way we look at candidate education. 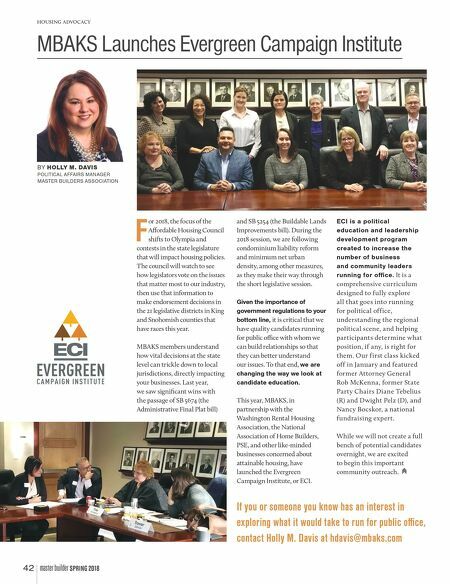 This year, MBAKS, in partnership with the Washington Rental Housing Association, the National Association of Home Builders, PSE, and other like-minded businesses concerned about attainable housing, have launched the Evergreen Campaign Institute, or ECI. ECI is a political education and leadership development program created to increase the number of business and community leaders running for office. It is a comprehensive curriculum designed to fully explore all that goes into running for political off ice, understanding the regional political scene, and helping participants determine what position, if any, is right for them. Our f irst class kicked off in January and featured former Attorney General Rob McKenna, former State Party Chairs Diane Tebelius (R) and Dwight Pelz (D), and Nancy Bocskor, a national fundraising expert. While we will not create a full bench of potential candidates overnight, we are excited to begin this important community outreach. F or 2018, the focus of the Affordable Housing Council shifts to Olympia and contests in the state legislature that will impact housing policies. The council will watch to see how legislators vote on the issues that matter most to our industry, then use that information to make endorsement decisions in the 21 legislative districts in King and Snohomish counties that have races this year. 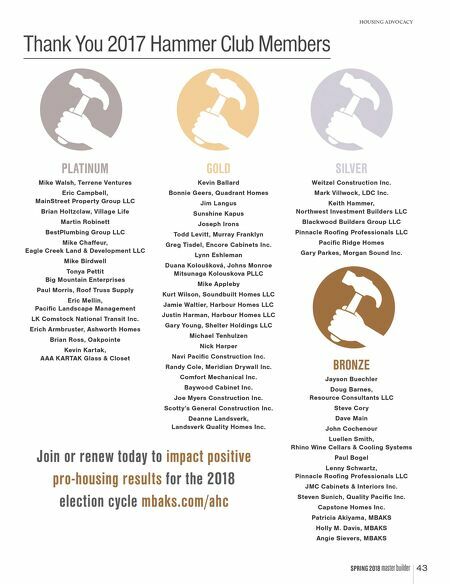 MBAKS members understand how vital decisions at the state level can trickle down to local jurisdictions, directly impacting your businesses. Last year, we saw significant wins with the passage of SB 5674 (the Administrative Final Plat bill) 42 master builder SPRING 2018 • "